This classic interview with the late Vice President Salvador “Doy” Laurel will help remind us of how the politicians of their era betrayed the people and allowed the country to deteriorate from bad to worse. The promises of the Cory administration were left unfulfilled, and the spirit of people power was betrayed by the misgovernance of the Aquino regime. According to the late Doy Laurel, the Aquino administration was no better than the Marcos regime, maybe even worse. During an interview, he mentioned that corruption was at it’s highest, and peace and order were much worse during Cory’s term than when she came into office. These words are coming from the Vice President of the Aquino administration. It came from the very person who was influential in Cory’s ascent to leadership. To hear this harsh words coming from someone who helped Cory Aquino get into office must mean something. Doy Laurel was disillusioned and realized that Cory Aquino doesn’t have what it takes to lead the nation. 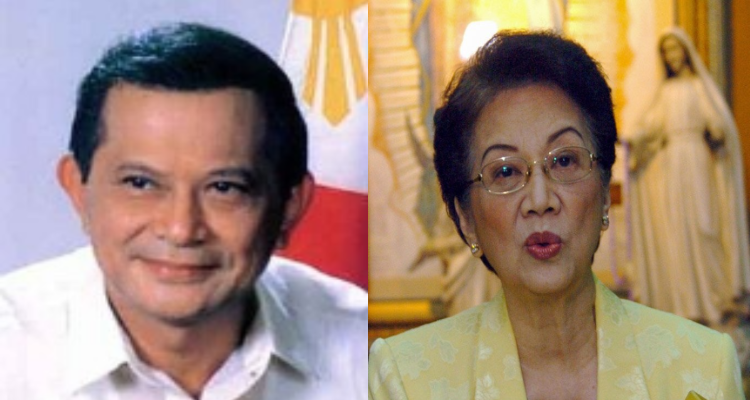 He bared that Cory does not have a direction on how to govern the nation, she was more like an innocent bystander hoping that the country’s problem would go away on its own. Doy Laurel expressed his deep disappointment with the Cory administration, the one that people had hoped would lead us to great heights. After the EDSA revolution, people were optimistic about the new administration, with her promises to stop graft and corruption. Instead, it turned out that her administration was more corrupt than Marcos. This may be the reason why most people who were present during the martial law are saying that it is way better than the Aquino administration. Due to the mess that she made when she took over the leadership, for many people, it’s like a jump from the frying pan and into the fire.